Actress Lupe Ontiveros, who co-starred in the hit films "Selena" and "As Good As It Gets," has died of liver cancer, her publicists said Friday. She was 69. Ontiveros passed away Thursday night. Before her death she had received phone calls from actors all over Hollywood as well as political figures, including Edward James Olmos and Hilda Solis, said Roy Cosme of Arcos Communications. TMZ reports that Ontiveros' "Selena" co-star Jacob Vargas was at her bedside when she passed. He told CNN in a statement that Ontiveros was diagnosed with liver cancer in January of this year, but kept it quiet from friends and family. The Mexican-American actress built her career playing domestic workers, and in a 2009 interview with NPR said she had appeared as a maid more than 150 times in roles on shows like "Who's the Boss." Her near-constant gigs made her one of the most recognizable Latina actresses in Hollywood. 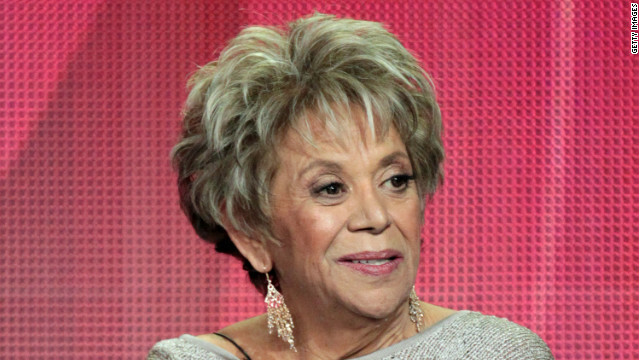 In an interview with CNN in 2009, Ontiveros said her repeated casting as a housekeeper was "upsetting." "It's upsetting to any culture when that is the only projection you have of that culture," she told Soledad O'Brien. "You're pigeon-holed, stereotyped. That means we don't like you. We forget that this country was founded by immigrants." One of her more recognizable roles came later in life when she played Yolanda Saldivar, the woman convicted of killing Tejano superstar Selena in the 1997 blockbuster movie of the singer's life. Jennifer Lopez, who starred in "Selena" as the titular superstar, said she's "tremendously saddened by the news of Lupe's passing! I've enjoyed her work throughout the years. She was a great actress and working with her in 'Selena' was an unforgettable experience. She will truly be missed." The National Hispanic Media Coalition praised Ontiveros as a "trailblazer" in a statement Friday. "She worked tirelessly to perfect her craft and open doors for countless Latinos along the way," said NHMC President Alex Nogales. "Hollywood never gave her the lead role, but in our hearts she will be remembered as our leading lady." Ontiveros was a founding member of The Latino Theater Company in Los Angeles, according to the NHMC. Actor Luis Guzman tweeted Friday, "R.I.P. Lupe Ontiveros thank you for all your work and being a Pioneer." Cosme, who serves on the board of the Latino Commission on AIDS, described Ontiveros as a community activist as much as a movie star, and a major voice in the Latino community's ongoing fight against HIV/AIDS. In the past, Ontiveros was a co-host of the Latino Commission on AIDS' fundraiser. Ontiveros' family said in a statement, "Our mother, Guadalupe 'Lupe' Ontiveros ... was a tireless advocate for many causes, which included G.L.A.D. (Greater Los Angeles Agency on Deafness, Inc.), United Farm Workers, A.A.R.P., The Latino Commission on A.I.D.S. and the Latino Theatre Company in Los Angeles ... All donations can be made in her name to her two favorite causes, G.L.A.D. (Greater Los Angeles Agency on Deafness, Inc.) and the L.A.T.C. (Los Angeles Theatre Center)." What a loss. I was inspired to write about it. I loved up to you will obtain carried out right here. The comic strip is tasteful, your authored material stylish. nonetheless, you command get bought an shakiness over that you would like be handing over the following. unwell no doubt come more in the past again as precisely the same just about a lot often inside case you shield this hike. My brother recommended I may like this web site. He was entirely right. This put up actually made my day. You can not consider just how so much time I had spent for this information! Thank you! Thanks for the good writeup. It in fact was a entertainment account it. Glance complicated to more delivered agreeable from you! However, how can we communicate? Hello my family member! I wish to say that this article is awesome, nice written and come with almost all important infos. I'd like to look more posts like this . Hey everybody!....My friend Nicholas was the son of Lupe Ontervio and met him at my high school's 18th birthday party. He introduced me to her in Van Nuys a few years ago and she looked beautiful inside/outside.....she did not like the big money and liked the simple life. I see why her life was too short and died days ago.......I will probably attend her funeral in Pica Rivera this week....oh my!....She is gone! !.....what a heartbreaking! !....geez I dislike to feel this way after whoever dies...you know?.....My mom died of liver cancer too 12 years ago..... Yeah...resting in peace. Hello there, just was aware of your weblog via Google, and located that it's truly informative. I'm going to be careful for brussels. I will be grateful in case you proceed this in future. Many other folks will probably be benefited from your writing. Cheers! hey sad face...if you need a friend (wink wink) just call me. hey miguel.. lean on this (wink wink)! It is appropriate time to make a few plans for the longer term and it is time to be happy. I've learn this post and if I may I desire to counsel you some interesting things or tips. Maybe you can write subsequent articles regarding this article. I desire to read more things about it! did some blog somewhere get crossed wires with this story? Some of the posts just don't make sense, even if they are just being jerks! Someone died, for pete's sake. Doesn't matter if you knew who she was, don't be such nimwits! you wanna meet my rental? its right in front. making fun of the friend? go nook yourself. Why no mention of Lupe's work on 'Desperate Housewives' in the article CNN. That is where most of us would recognize her from. Rest In Peace Lupe...the villianess is always the most memorable ! Hi there, I discovered your site by way of Google at the same time as searching for a similar subject, your site came up, it seems great. I have bookmarked to my favourites|added to my bookmarks. Who cares everyday people dies and terrible ways this one was old and rich ! Who cares? That's what everyone is going to say when YOU die! Except you'll be old, bitter and dirt poor I'm sure! RIP girl. the latino community will miss you! She was a great actress and will be missed by the Hispanic community. I loved her in "The Goonies". Crappy actress and ugly, to boot. You must truly be an awful person. it does make everyones day fun! Lupe seemed like a true professional and a darn nice lady. please rip my sweet. need to know if goonie wants. She was a wonderful actress, but I will always remember her as Nacha in El Norte, a great movie that everybody needs to see. RIP Lupe! So I'm reading all the nice comments on the loss of this wonderful actress, then I come to this sheriff moron. Then I keep reading & I come to the ip crap idiot. Did all the crazies escape from the happy hospital? Man, I can't wait until school starts again! Rip Lupe. From Goonies all the way to Beverly Hills chihuahua she was always a sweet lady. why this? we fixed most of the issue(i think)..can we not go forward and just blog? All the flags at Pancho's are at half mast. Excellent post. I was checking constantly this blog and I am inspired! Extremely useful info particularly the closing section 🙂 I take care of such info a lot. I used to be seeking this certain information for a very long time. Thanks and good luck. Anytime anyone who had anything to do with "The Goonies" dies, it's a national tragedy. WHY is nobody mentioning that this was the actress who was on the receiving end of one of Jack Nicholson's greatest lines ever: "Sell crazy someplace else. We're all stocked up here!". i'm fixing the bad press, yet i continue to receive all this disrespect...there is no ip match and no loans. who is this person? I loved her acting. They dont make these kind any more. Its all flash and no substance now. Rest in peace. blogging is fun. we have to stop taking it so seriously. the guys i work with find i amusing too. THANK YOU FOR WALKING RIGHT INTO THE TRAP..NOW WE WILL LOCATE WHERE YOU ARE AND THAT WILL DETERMINE WHAT'S NEXT. it the truth..she's our puff "mouth" and we see it allllllllllllllllll day. You were great in your movies RIP Lupe. As for the ignorant people on this board. If you put them all together I doubt you could come up with one viable brain cell. "get smackin" - its abou6 16 yrs now? who's the heck is blondie? No offense but I did love you in the Goonies and Selena. no respect for a fine actress who's dead..what a disgusting group of people who gave crap reviews. I am NOT a latino and wish all you people would go back where you came from. As for this third rate actess, she just got her fifeen minutes although she probaly didn't deserve it. who? never heard of her, just because CNN is trying to cater to different viewers. never heard of her, just because CNN is trying to cater to different viewers. huh? wha? I done taught she done dead alreadys?!! she wadn't dead yet? lord have mercy. Please do not lecture anyone on any language when you do not have a grasp of the one you are using. I am not perfect in my use of the English language. However, I do try harder than many to spell words completely and properly and to use proper grammar and punctuations. The quality of the English in your post would make anyone cringe whether they were native English speakers or a native speaker of Spanish trying to understand what you are saying. 'Though she was not a beauty queen or a popular lead actress I knew exactly who she was and saw her face in my mind when I read the headline of this story: Lupe Ontiveros made an impression. To her family: you have my sincere sympathy. I just buried my father yesterday. You have my sympathy Jerry. Peace be with you and your family. Why does the article continually use the term, "passing", "passed"? What does that mean? She didn't "pass", she died. She's dead. She's gone. CNN, please stop imparting your religion on the rest of us. Stop being afraid to use the words DEATH and DEAD! Thats the stupidest post I have ever seen....not even close. How is passed a religious term? She "passed" from one existence to another. The word has nothing to do with religion. Whether you believe in an afterlife or not, the fact is we become something else, maybe a spirit, or simply part of the earth, either way, there's no need to be an a**hole. My favorite scene with Ms. Ontiveros was in The Goonies, when 'Mouth' was giving her "instructions" in Spanish. Hilarious! OOOOOppppsss........................when I read the headline "Lupe Ontiveros dies at 69" I thought she choked! Oh well. You will have that fate. you must know...how many times a day do you partake? aw, she was an awesome actress. rip. So? You needed us to know that? So why you reading this? Sounds like Sheriff Joe hasn't been laid in a quite a while. Poor ignorant @sshole. Now, Sheriff Joe, kindly go pull your head out of your @ss so your brain can resume getting oxygen and you can hopefully make sense. Pendejo! RIP Lupita...you were so much more talented than many of these ignorant pendejos on here will ever hope to be. GOONIES! What a treasure you were. God love you Rosalita! Rest in Peace, Lupe. I did not see everything you were in, but the moment I saw your name, then saw your picture, I remembered your presence, and am saddened at the loss your friends and family feel. God bless your memory, and your friends and family, for you were surely blessed with talent, and we were blessed for having enjoyed your work. amazes me when ###wipes like this sheriff joe n the rest of ignorant ppl always claim how they r american. naw baby, ur not. do remeber there lived a whole differant ppl for thousands of years b/4 "pilgrims" arrived. n no,they (pilgrims) were not wealthy or well-educated. n still not when listening to u sheriff joe n ur racist counterparts.ms. lupe was an american actress who passed. respect given.n ca, i've never seen a white person in feilds. wanna job? go to it!u nvr would make it. 2 hard of work. Dude, you do her no favors. Learn to read and write first, then you may post. Go away now, take your meds and hope you feel better soon. Her at a party for five songs! What a dancer! great actress and professional. rip my dear. you are one stupid ignorant Pump and Dump. really?????? what an ignorant you are ! Mentally deficient are you? Who's talking about music? Jeezzeee white people are so stupid. Que descanses en paz Lupe. I enjoyed her in every movie I saw her in, a very good actress. Remember when we used to say that death comes in 3s. This year is at least one every week. This week is was two with the death of Sherman Helmsley. Lupe, I only saw you in a few films and you were great in all of them!!! I'm sorry Hollywood has only limited your roles to playing only servants. I'm sure you would've been able to shine no matter what was the part!!! "latina" might not be a nationality but "mexican" iz a nationality. simply put, mexico iz a nation. not a race. so yeah i got it right the whole time. thankz anyway....now for the late latina actress, much love n peace be wit her friendz n family. I always complain about this particular subject. She ain't Mexican, she's American. Born and raised. But children of foreigners are always taught to negate their nationality. If you are born here, you're American not mexican, not German but American. People born here are still using that stupid hyphen, whatever-american, it really puts into question where their loyalties lie. Never seen or heard of her. Learn to think for yourself again and rage against the Globalist media control complex! You needed for us to know that? Lupe who? Must be a slow news day. Lupe morethanyoulleverbe dumb a$&, have some respect, what do you expect a bus full catching fire just to satisfy your boredom, get out and get a life moron. JUst because YOU haven't heard of her doesn't mean others haven't. And that whole "I don't care so it must be a 'slow news day'" is so old and hackneyed that even using it makes YOU look like a complete tool. Awesome, talented actress..may she rest in peace. Muchas Gracias por todas tus contribuciines. lol @ ppl sayin CNN racist. yall fail to realize some ppl are proud of their nationality. so i ask again, y doez it bother yall so much? plus itz been known that the onez that are worried about other ppl's race bein mentioned are the onez bein racist themselvez in some casez. jus sayin. Her nationality wasn't "Latina." There is no such nationality. Her nationality was American. If you want to get more specific, she was an American actress of Mexican descent. RIP Lupe!! You r already greatly missed!! We will never forget you!! Lupe hated the mention of her role in Selena. She was proud of EL Norte, As Good As it Gets, Real Women Have Curves, Zoot Suit. Please stop mentioning Selena. This was unexpected, we are devastated. Our matriarch is gone! The movie Selena was part of her resume, and she did a great job. It was her breakout role. I don't know what you're talking about. @Susan – Ingrid knows what she's talking about. They were co-stars in "Real Women Have Curves", and had remained close friends. As a close friend and colleague, it's no surprise that Ingrid would have some insight to share on Lupe's feelings and the words that she spoke while she was living. Goonies Never Say Die!!! RIP Rosalita! Sheriff Joe must have had bath salts in his cereal. nothin to do wit race? u in the U.S.A. race iz play'd here one way or another. get used to it. She went to that great big taquería** in the sky. Bon Voyage, fair maiden! But you had to have tested for the role(s) you were in on your own accord, therefore you did nothing to change the "stereotype" other than to continue encourage it. why doez it bother some of yall when CNN put "latina" or any other national origin of a person in the headline? it might not matter to some of u but to many otherz it speakz volumez in a positive way. jus let it be. Why do you not know how to use an "s"? she was hilarious in "real women have curves"
Thank you for the dances Lupe and your radiant smile. You will be missed. You helped Latinos Artists in more ways than I can say. RIP friend. Sheriff Joe, you senile, ignorant, racist freak of nature, why don't you crawl back into the hole that you came out of ya nasty piece of crap! RIP, dear Lupe...you left us too soon...will always enjoy & appreciate your work! Ay! Dios mio! Remember Beverly Hills Chihuhua? "MIRA!" That movie was repleat with stereotypes. Lupe was the ignorant, poor Mexican housewife – always in a house coat. Her husband "hurt his back" and had a landscapping business. He also played guitar and the accordian. Their house was neon with color. And let's not forget – they owned chihuhuas! And in the Goonies, that evil punk Corey Feldman locked her in the closet with the cucarachas! I really liked her in Desperate Housewives as Carlos's father and Gabby's nemesis. She was capable of so much more than playing a maid. I really hate Hollywood. Wow...what a lot of IGNORANT people on this board. Didn't your folks teach you people any manners? If you don't have anything good to say, THEN DON'T SAY ANYTHING AT ALL! This woman has family. RIP Lupe. Good one Casey!! I was wondering if Sherrif Joe and I were reading the same thing!! Whew...I was getting worried for a moment. Hollywood lost a great ACTRESS. Not a great "latino" actress. The sooner we lose the prefixes on people the more inclusive our country will become. It was a pleasure watching movies with this ACTRESS in them. my thoughts exactly. why in the hell did they have to put 'latina'?? They put "Latina actress" because the media is racist and wants to segregate this American actress from everyone else. I still don't understand why? god put people like you in earth, but anyways, with the rule that you are measuring miss Lupe with the same rule you will be measured the day you die. RIP. Mrs Lupita balla con dios, and god bless you. I think you mean vaya con dios. Balla con dios doesn't mean anything. The real Sheriff Joe wouldn't say that. You are a pathetic and heartless being who has nothing better to do than spew your hate on a story about a hard working woman. Shame on you! @Sheriff Joe; go back to the early 1800's where you belong. American will move forward, not backward regardless of what corwardly, ignorant, trailer trash folks like you think and feel. You're on the wrong forum for your hate anyway. AMEN Sheriff, keep up the good work... Tucson luvs you..
WTG Sheriff Joe! America was settled by immigrants, yes, but they were NOT peons. They were by and large wealthy educated people that came here first...the Pilgrims and our forefathers were moneyed, not economic refugees. When I read the headline, I thought, "Who?". Recognizable to whom, exactly? If the woman was upset that she was typecast as a maid, maybe she should have looked at her culture for the answer. They keep to themselves in slums, fighting over territory and drug routes. You see it here in the US, you see it down in Mexico. It is what it is and that perception will not change until they change their reality. Rid the US of the rabble before it's too late. If you're too lazy to even learn the language here, you're not deserving of our oxygen. If you're in Colorado, then you should be worrying about crime by crazy white men. Hypocrite. Rod C Venger–most of the white Europpeans who came here were SERFS, indentured servants, or convicts. In fact, Georgia and Virginia were originally penal colonies. Learn some history. .....and we will always remember you for eeeevvvveeerryyyyyythiiiiiiiiiiiiiiiing you have done thus far. Go away. Seriously, can you just please go away???? Third world mexican crap, NEXT! You are no Sherrif Sir...You are what we call "White Trash". Good Day! Don't be bitter cuz nobody is going to care when you die. Rest in peace, beautiful lady. I'm old enough to remember you and appreciate you for your gift to the world. Our dear friend LUPE ONTIVEROS DIES! Thank you for all the good memories and talks that we had during our "NOSTROS" Days. You are always going to be our loving "NACHA" to my family and I, because of your outstanding role in the picture "EL NORTE". May you R.I.P. YOU ARE WHAT MAKES THIS COUNTRY UGLY! JUST BECAUSE YOU LIVE A MISERABLE LIFE DO YOU HAVE NOTHING BETTER TO DO THAN SPREAD HATE? GO OUT AND FEED A HOMELESS, HELP SOMEONE IN NEED, AND I BET YOU WILL FEEL MUCH BETTER. Why yall trolling on a wonderful woman who passed away, when yall could be on the new dancing with the stars blog trolling on live ppl like kirstie alley and bristol palin! RIP lupe, sorry you had to leave so soon. Wow, what a racist you are, Jenna. But, seriously, violence knows NO race. Why don't you talk to the families of the 300 plus Mexicans who have been killed by their own people over drugs? Or the blacks who kill each other over drug money? It happens everywhere, people killing each other. Sad, but nothing to do with race. It's people like you who want to make it that way. I suggest you grow up. Jenna, how fat are you? The moderators are out in force today. I think I'm on Fox. People please, we lost a great actress, please be respectful online to the family of Lupe, Forgive us on earth Dear Lord for our rudness and disrespectfulness towards the loss of another soul. May Lupe, Rest in Peace! I believe it is due to the media's obsession with categorizing people by their ethnicity. The article's summary statement made that clear. CNN reporters emphasize these types of things. For example, yesterday CNN put out an article whose topic was that Sally Ride was a lesbian, as if that matters. exactly! why do they have to do that? Where do they teach you to talk like this? In some Panama City "Sailor wanna hump-hump" bar, or is it getaway day and your last shot at his whiskey? Sell crazy someplace else, we're all stocked up here. Meanwhile how many Americans died today??? she was an AMERICAN citizen, you heartless idiot! Why would someone else be more American than her? Unfortunately, it was not you. Well, at least one according to this article. I think your hood might be cutting off your oxygen. See, being hispanic does not preclude one from being an American. If only IQ did, we could start expelling m()r()ns like you. Never heard of her or the movies she was listed as being in. @Righster; And? So what? Who cares if you never heard of her. That's supposed to make her less respected in your ignorant mind? Go do some work around that double-wide trailer of yours and let the folks who do know who ths wonderful actress was pay our respects. Typical ignorant, trailer trash idiot – blaming others for their misery. Have some respect. Only a coward speaks ill of the dead! what a trashy, classless comment. He's bored. His banjo's broken, he already brushed his tooth, and they don't allow comments on the FauxNews site. May you be blessed and live to be as old as she did. Maybe your obnoxiousness will be replaced by wisdom, before your expiration date. One of my favorite performances of hers was as Nacha in the movie "El Norte" which was a gripping, sad story in which she also managed to find comedic moments ... finding multi-layers in a character is a sign of a gifted actress. Rest in peace my friend. I think she did a great job as the witch in the first the matrix movies. Didn't she act in "End of Days" with Arnold? Yea as an actress she was very talented as for her passing God Bless and sorry to the family's loss. Plz ignore these poor peoples thoughtless thoughts and rude behaviors. God will mind them when it's their time as well. Thanks for mentioning her playing Carlos' mom. NOW, i do remember her. RIP Lupe! She played the maid on "Who's the boss?". I thought the premise of that show, was that Tony Danza was the male maid. Rest in peace Ms. Lupe. VAYA CON DIOS! That's too bad.......Not sure when they chose Selena it identify her, but she was funny in Rob last fall. You must not read very well . . it said she played the person who KILLED Selena, not Selena herself . . .
RIP Lupe. Gracias for your excellent work. Don't pay attention to those poor brainless. Blessings. Clown question jimbob, but she was born in Texas, so that would make her a US citizen. Lupe was always type cast. Hollywood never gave her a real chance because she was Mexican-American.She was talented and funny but didn't fit the Hollywood mold. In taking these roles her help promulgate the racial biases and sterotypes of Hispanics. What a good actress. For those who have posted, "Who", "Never heard of her", I have to say why did you even post! That's really not nice. I agree with you. If you don't know who the person is then keep your mouth shut. amen for a sweet lady – and ps buffoons – Jennifer Lopez played Selena! May God rest your soul, Ms O. Don't forget she was also in Babel. That's the movie that popped in my head right away when I saw her! Might you be mistaken about Babel? I don't see her listed in the credits for that film. Alcohol doesn't cause liver cancer you fool. It causes cirrhosis. Loved her in As Good as it Gets too....took me a while after the movie "Selena" to like her....that is a testiment to her talents as an actress. Fine Actress whose talents and contributions will be sorely missed! May God bless her. I loved her as the mother in "Real Women Have Curves" with a young America Ferrara (i think thats her last name). SHe was funny in that movie. R.I.P Lupe! I agree with you Kriss. She was awesome in "Real Women". I first saw Ms. Ontiveros in the move Selena (where she played the role of an obsessive murdered) that her role in "Real Women" was a refreshing turn. Thanks for mentioning that very funny but poignant movie! R.I.P. she played the best roles as the one who was serious and had the shoulder to cry on. she will be missed prys for her family and friends. god bless you. Few performances have made me laugh and cry like her work in Todd Solondz's HAPPINESS. She was an incredible actress, and I'm very glad to see her receive proper tribute. RIP. I loved her in As Good as it Gets. She was a great pioneer and actress. well bless her heart,she will be missed great actress. well my goodness,bless her heart,rest in peace.great actress.she will be missed by many.condolences for the family at this time.